10" Solid Country Grade White Oak flooring installed, sanded and finished with 1 coat Dura Seal Ebony/Espresso blended stain and 3 coats Bona Traffic HD Satin polyurethane. This was an exciting project for us. 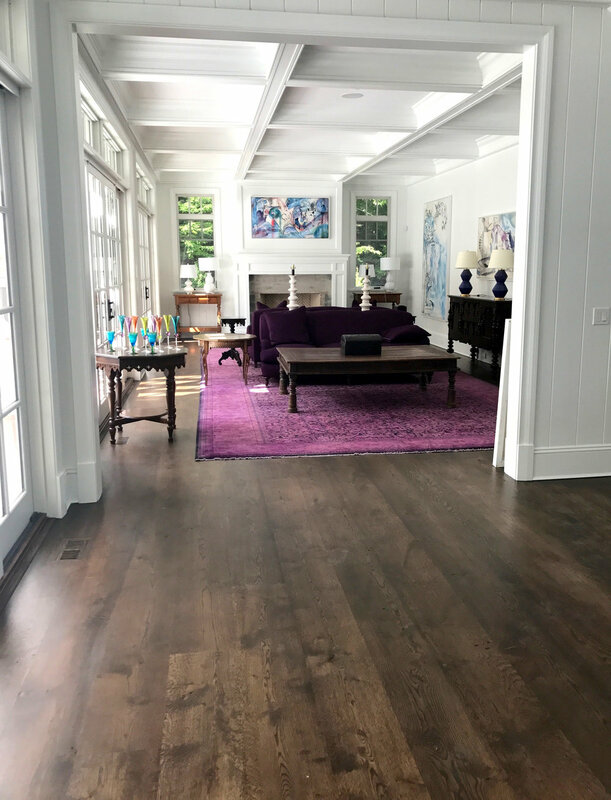 We love working with extra-wide width material, and the home is massive - we installed and finished nearly 5,500 sq ft of hardwood flooring here! We also sanded and finished all of the handrails and all of the nosing on the walls around the front of the foyer, which required a really tall ladder and a lot of dedication! The customers wanted a rich, dark stain to contrast with the white walls and white kitchen. We were thrilled with the outcome, and so were they! with 3 coats Bona Traffic HD Satin polyurethane. Originally, we were called to this home to sand the floors on the main level and return them to their current color - basically black - so that the homeowner would not have to re-sand the 5 upstairs bedrooms and hallway. It was hard to tell that they were even Walnut! We advised that our choice would be to leave them natural instead of staining them again, even if it involved coming back at a later date to do the 2nd floor. Once we sanded off the old stain everyone was in agreement! The first floor and 2 sets of treads were finished in phase 1, and we came back a few months later to complete the 2nd floor. Natural Walnut is gorgeous, and the lighter color makes the house look so much better! 2 1/4" Red Oak sanded and stained with Bona Driftwood and 3 coats Bona Traffic HD Satin polyurethane. We love giving an older home a new look! The homeowners here did a kitchen and family room renovation and wanted to modernize the style of their home. We knew we wanted to do something grey for the floors, and we tried a ton of blends before finally showing them Bona Driftwood. Right away everyone saw it was the winner - muted the Reds and perfect color for a new, contemporary look! 5" Select Grade White Oak installed, sanded and finished with 2 coats Dura Seal Country White stain and 3 coats Bona Mega Clear HD Satin polyurethane. New construction = blank canvas! We installed solid 5" wide plank White Oak hardwood flooring throughout the first and second floors of the home. In the basement, we installed 5" Unfinished Engineered White Oak, and finished all 3 levels with a double application of White stain for a super contemporary, light, beachy look -- just perfect for this house, both the architecture and the decor! 3" X 21" Rift & Quartered White Oak Chevron flooring installed with 1.5" Peruvian Walnut feature strip in border, sanded and finished with 1 coat Rubio Monocoat 2C Hardwax Oil finish, color Natural. This old home in Locust Valley had numerous projects going on in separate areas of the house! Our project was the Master Bedroom, and when the homeowner requested a Chevron floor, we were thrilled to do the project. It was also very important to them that we use a VOC-free, 100% natural product, so we suggested Rubio Monocoat. Though it does come in many colors, we did not want to take away from the beauty of the pattern or the depth in the natural wood. We love how this one came out! 105-year-old Quarter Sawn White Oak parquet floor sanded and finished with 2 coats Dura Seal Special Walnut stain on infield and 2 coats Dura Seal Colonial Maple stain on border, 5 coats Bona Traffic HD Semi-gloss polyurethane. We were so honored to be asked to restore the floors in the Breakfast Room of the 105-year-old Hempstead House Mansion! The character in these antique floors is amazing! The Sands Point Preserve was built by the Gould family in 1912, then purchased by Guggenheim family, and now is owned by Nassau County, NY. Today, Hempstead House hosts scores of weddings, historical tours, movie filming, and large-scale events. The floors were badly in need of repair, and we were thrilled to help preserve an important part of our NY history! Want to see more of our past projects?